1:50 First Gear *MAROON & BLACK* Kenworth T880 Dump Truck *HIGH DETAIL* NIB! Kenworth T880 Dump Truck. Tilting dump body with opening tailgate. Opening hood with authentic engine detail. Opening doors with detailed cab interior. Top quality associated with First Gear models, superb detail and paint. First Gear 50-3263WR Kenworth T880 w/Vactor 2100 Plus PD Combi1/50. • opening hood with authentic engine detail. • opening rear door. 1:50 First Gear *YELLOW & BLACK* Kenworth T880 Dump Truck *HIGH DETAIL* NIB! SIZE: 6.5"L X 1.5"W X 2.5"H.
Mfg by:Hartsmith Models / ASAM Serial WHF187. WINNER WILL RECEIVE ITEM(S) PICTURED. Boom has movable parts. Item(s) are used (Display Only), in "as new" condition! Item Number:WSI 32-2001 Color: Premay. Kenworth C500B Heavy Tractor. with Ballast Box. 14 years of age. WINNER WILL RECEIVE ITEM(S) PICTURED. FEATURES / FUNCTIONS OF KENWORTH T908 Made By : TWH. Locking fifth wheel. Sliding fifth wheel. Realistic engine detail. Scale :1/50. Bogie drive with 50" sleeper. Detailed interior. Kenworth K200 Drake Truck Tractor - "NQHH" Version. Made By : TWH Collectibles. FEATURES / FUNCTIONS OF KENWORTH K200 Locking fifth wheel. Sliding fifth wheel. Realistic engine detail. Scale :1/50. Photo etched heat shields over mufflers. Superb model and paint, museum quality scene-builder. • Pivoting cab. • Locking fifth wheel. • Sliding fifth wheel. • Detailed interior. • Rubber tires. • Realistic hose detail. Superb model and paint, museum quality scene-builder, Z01375. • Pivoting cab. • Locking fifth wheel. • Sliding fifth wheel. • Detailed interior. • Rubber tires. • Realistic hose detail. Drake Kenworth K200 Prime Mover "SILVER TONGUE DEVIL / FAT CAB 2" - 1/50 "NEW"
I have the brother version listed as well in the Blue/Grey MISSISSIPPI FLASH FAT CAB 1 edition and they are scarce. Here is one for you to own. Model shown without mirrors but they are included in the box. Kenworth T909 Drake Truck Tractor - "Burgundy" Version. 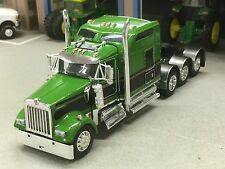 FEATURES / FUNCTIONS OF KENWORTH T909 Made By : Drake Collectables. Locking fifth wheel. Sliding fifth wheel. Realistic engine detail. Bogie drive with 50" sleeper. Made By : TWH Collectibles. Kenworth K200 Drake Truck Tractor - "White & Red" Version. FEATURES / FUNCTIONS OF KENWORTH K200 Locking fifth wheel. Sliding fifth wheel. Realistic engine detail. Scale :1/50. Kenworth K200 Drake Truck Tractor - "Rosso Red" Version. Made By :TWH Collectibles. FEATURES / FUNCTIONS OF KENWORTH K200 Locking fifth wheel. Sliding fifth wheel. Realistic engine detail. Scale :1/50. Superb model and paint, museum quality scene-builder. • Pivoting cab. • Locking fifth wheel. • Sliding fifth wheel. • Rubber tires. • Realistic hose detail. • Suspension detail. Top quality associated with First Gear models, superb detail and paint. • rotating mixer body. Made By : TWH Collectibles. Kenworth K200 Drake Truck Tractor - "Silver" Version. FEATURES / FUNCTIONS OF KENWORTH K200 Locking fifth wheel. Sliding fifth wheel. Realistic engine detail. Scale :1/50. This is a nicely detailed diecast Model of a black and silver Kenworth T880 with a Lowboy Trailer and the following features 3 - Detacable gooseneck trailer with a load ramp. Top quality associated with First Gear models, superb detail and paint. Kenworth K200 Drake Truck Tractor - "McAleese" Version. Made By : TWH Collectibles. FEATURES / FUNCTIONS OF KENWORTH K200 Locking fifth wheel. Sliding fifth wheel. Realistic engine detail. Scale :1/50. FEATURES / FUNCTIONS OF KENWORTH C509 Made By : Drake Collectibles. Locking fifth wheel. Sliding fifth wheel. Realistic engine detail. Scale :1/50. Rubber tires. Wire mirrors. Kenworth K200 Drake Truck Tractor - "Burgundy" Version. FEATURES / FUNCTIONS OF KENWORTH K200 Made By : Drake Collectables. Locking fifth wheel. Sliding fifth wheel. Realistic engine detail. Scale :1/50. Made By : TWH Collectibles. FEATURES / FUNCTIONS OF KENWORTH K200 Locking fifth wheel. Sliding fifth wheel. Realistic engine detail. Scale :1/50. Detailed interior. Year Produced: 2013. Made By : TWH Collectibles. FEATURES / FUNCTIONS OF KENWORTH K200 Locking fifth wheel. Sliding fifth wheel. Scale :1/50. Right hand drive. Detailed interior. Year Produced: 2013. FEATURES / FUNCTIONS OF KENWORTH K200 Made By : Drake Collectables. Locking fifth wheel. Sliding fifth wheel. Realistic engine detail. Scale :1/50. Detailed interior. Rubber tires. Kenworth K200 Tractor w/ Drake Trailer - "McAleese" Version. Made By : TWH Collectibles. FEATURES / FUNCTIONS OF KENWORTH K200 Locking fifth wheel. Sliding fifth wheel. Scale :1/50. Photo etched heat shields over mufflers. 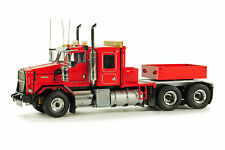 WSI 32-2000 Kenworth T800W 4-Axle Tractor - Miller Transfer 1/50. Kenworth C509 Tractor w/ Drake Trailer - "Hogans Heavy Haulage" Version. FEATURES / FUNCTIONS OF KENWORTH C509 Made By :Drake Collectables. FEATURES / FUNCTIONS OF 5x8 Swingwing with 2x8 Dolly Trailer. Kenworth K200 Tractor w/ Drake Tractor - "Rosso" Version. Made By : TWH Collectibles. FEATURES / FUNCTIONS OF KENWORTH K200 Locking fifth wheel. Sliding fifth wheel. Scale :1/50. Right hand drive. Detailed interior. Made By : TWH. FEATURES / FUNCTIONS OF KENWORTH K200 Locking fifth wheel. Sliding fifth wheel. Scale :1/50. Detailed interior. Rubber tires. Realistic hose detail. Kenworth K200 Drake Truck Tractor - "Mactrans Heavy Haulage" Version. FEATURES / FUNCTIONS OF KENWORTH K200 Made By : Drake Collectables. Locking fifth wheel. Sliding fifth wheel. Realistic engine detail. Hard to find. Made By: TWH Collectibles. Functioning suspension. Suspension detail. Locking fifth wheel. Sliding fifth wheel. Rubber tires. Realistic engine detail. New Ray diecast, Kenworth model cement truck, construction vehicle. Nice!